No Halloween party is complete without some kind of creepy cocktail. Whip up these drinks to impress your guests—or maybe just frighten them! Hi-C Ecto Cooler is chartreuse green in normal light, but the Chroma Cool cocktail is reported to turn a glowing purplish-blue under a black light. The key color-altering ingredient is the quinine in your tonic water, so don’t substitute your mixer. 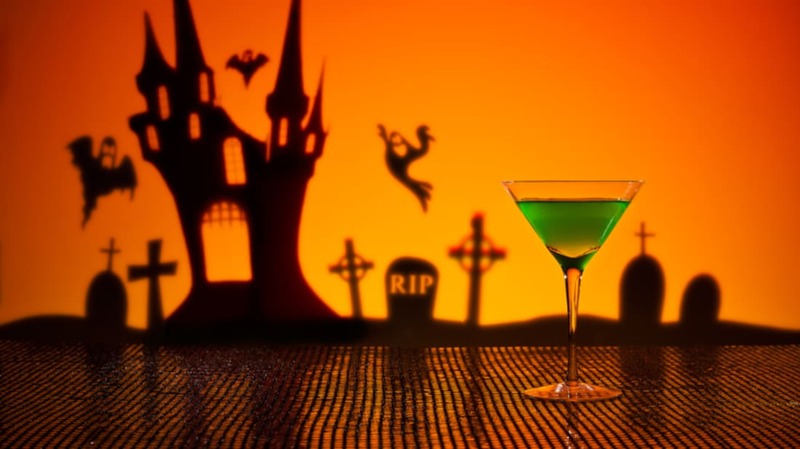 To make a Vampire Kiss Martini according to Delish, layer raspberry liqueur, vodka, and champagne in a chilled martini glass and garnish with your choice of Halloween candy. HonestlyYUM brings us a rum punch with real pumpkin and spices. First, create a spiced syrup by following this recipe (but leave out the rum). Combine the syrup with spiced rum, orange and lemon juices, pumpkin puree, and sparkling water. Stir well, then strain through a fine mesh and chill until party time. Instructions for the spooky presentation in a mist-covered pumpkin are here. Toni Dash has a sweet Halloween treat for grownups. Rub the rim of your glass with a lemon slice and dip it into the Pop Rocks, then shake the other ingredients together with ice, and strain it into the glass. The tricky part is the candy corn-infused vodka, which takes about five days to make. You'll find the process, with pictures, at Boulder Locavore. Dini at The Flavor Bender concocted a beautiful cocktail with horror overtones. Pour apple vodka and Viniq in a cocktail glass, leaving some room at the top. (If you don't have Viniq on hand, you can follow these instructions to make your own.) Add grenadine by spoon and allow it to settle at the bottom. Add dry ice just before serving for a spooky effect. Note: always tell your guests to wait until the dry ice is completely evaporated before drinking. Do not touch dry ice with bare fingers. Fans of The Walking Dead will appreciate the appearance of the tasty yet dread-inducing Negan Cocktail from The Boulder Locavore. Pour the bitters and water over the swizzle stick into a glass and stir with Lucille, er, the swizzle stick. Add rye and an ice cube. As the sugar on the stick begins to melt, it will look a little gross, just like in the show. When you want something more than a pumpkin spice latte, check out this cocktail recipe posted by Instagram user thelittlemarket. Combine Casamigos Blanco, agave nectar, almond liqueur, organic canned pumpkin, and Angostura bitters in a shaker with ice, shake for 10 to 12 seconds, then strain into a glass and add whipped cream, nutmeg, and cinnamon. For an additional spooky effect, rim the glass with a little black sugar before pouring. One of the scariest horror stories of all involved a potion, so it only makes sense to serve it at your Halloween party. To make this cocktail, combine vodka, parfait amour liqueur, blackberry liqueur, tarragon simple syrup, fresh lemon juice, and lavender. Before pouring, rim your glasses in purple sugar, skewer blackberries on a sprig of lavender, or add dry ice. (Or do all three!) This drink can be served in clean chemistry beakers for maximum effect. The Bloody Brain Shot is the classic disgusting Halloween drink more famous for its appearance than its flavor. Mix strawberry vodka and lime juice in a shaker with ice and strain into a glass. Carefully add Bailey's Irish cream with a spoon, straw, or pipette which will curdle and form a brain-like shape as it floats on top. Dribble some grenadine carefully over the top to add the look of blood. Drink it quickly, because it tastes almost as disgusting as it looks. You can also add blue Curacao to make it an Alien Brain Hemorrhage. This cocktail was created by Captain Morgan for its limited edition Jack-O'Blast pumpkin spiced rum. Combine 1.5 ounces of Jack-O'Blast with 2 ounces of orange juice in a glass of ice and stir. Finally, top with 2 ounces of club soda. Bottoms up!